I don't think that I've had any of those sorts of comments on my blog to date. Then again, I follow quite a few blogs where I'm interested in their subject matter but I have no expectation that they will be interested in mine. To me, blogging is an outlet. Somewhere that I can post things that I want to say, stories that I want others to be able to read if they are interested, etc. I don't put ads on my blog, and I don't care whether I have 2 readers or 2000. I often see people post in forums about having started a blog, or promoting a blog. Often, I'll have a look and follow if it looks interesting. If they're rude or excessively pushy, I probably won't even bother to look at the blog. A good example would be the woman who rudely threw business cards with the link to her blog all over our table and told us to follow her blog, while about a dozen of us were sitting chatting at IMATS. A couple of people rolled their eyes and cards were left lying around on the table. When the woman came back a few minutes later and threw more cards around and again insisted that we must follow her blog, the cards were all gathered up and thrown in the bin almost as soon as she walked away. She'd crossed the line from merely inappropriate to making a complete fool of herself. Rin - yeah I'm just ignoring it now too, but on days I get extra annoyed I delete it. Alice - I think when people are excessively pushy it just has the opposite effect on us. And OMG at the woman at IMATS. There is nothing wrong with exchanging business cards, but insisting that people follow the blog... that's just taking it too far. What a fabulous post! I've been blogging for about 6 months now and I remember (sounding like an old woman here) when I first started I so badly wanted it to be "successful" which in my mind meant having a huge readership. But as time has gone one it's become less and less about being "successful" and more and more about being fun. Sure it's nice to know people are reading my ramblings but I'm amazed at all the other things that have come with it that I never expected - I've met so many lovely like minded people both in person and through twitter and my blog, it's really driven my passion for polish to a whole different level and how much more effort I take to look after my nails now. My poor purse is lamenting it all because I now follow so many beauty blogs and have a constant craving to try new products too. I've come to realise that it's all about the community that makes the blogosphere go round and the mutual respect and love for our passions, nothing to do with readership. If someone reads my blog and likes, then great. If someone reads it and doesn't care for it then that is fine too. If I don't like a blog, I don't read it and I think everyone should have that prerogative. The woman at IMATS wasn't exchanging business cards. She walked up to a table of strangers and threw cards around, demanded that we follow her, then moved on to the next table! This post is so true and so relevant! I hate when i get comments from people asking me to follow their blogs. If someone follows me or leaves a nice, genuine comment on my blog, then i go and check out their blog anyway. But if someone leaves a message saying 'follow me,' it just annoys me and makes me not want to follow them. Sometimes the messages come from people whose blog is not even in English and i sit there thinking, why would i follow a blog that i cant even understand? When i first started getting messages from people asking me to follow, i just followed back. I thought it was easier and didn't want to be rude, but these days, i just don't care and ignore the comments. 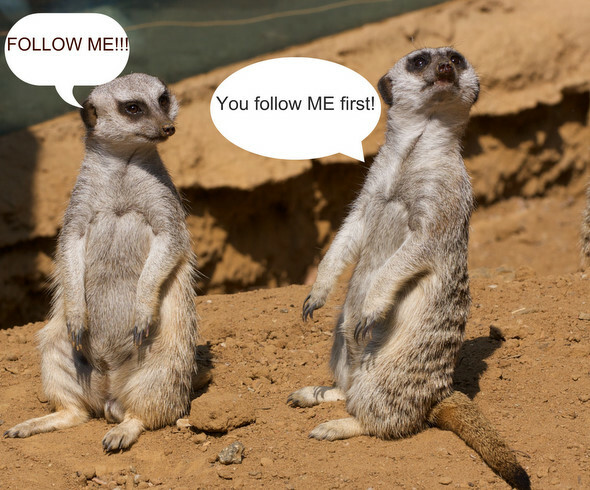 I understand people want to get their blogs out there, but there are better ways to do it than demand followers! I will occasionally check out the requestor's blog but I'll only follow if it grabs my attention. Otherwise I'll just ignore the request. That's just so childish and immature, annoying for sure! I rarely get those comments though. I was there too with Alice when the girl threw cards at us. It was disrespectful to herself in so many ways! Alice - that's just plain rude and selfish. I wonder how many people actually listened to her command and followed. Vita - I'll check out the blogs too, but depending on how pushy they are even if the blog is nice I won't follow. Su - I've had people unfollow too, it happens when a giveaway I'm hosting is over (LOL), or if I don't follow them back, or I'm assuming they don't like my posts. Besides the "follow me" commenters which are easy to track down when they unfollow, I wouldnt have a clue who else unfollows. And as for that girl at IMATS, very very rude and selfish. Good on you for posting this! I've personally had enough of this "follow me" nonsense. Follow and read my blog because YOU want to, because it interests you. Not because you want me to follow your blog! Thank you for posting this Lilit... I feel A LOT of those bloggers need to wake up and realise that asking people to follow your blog is not going to get you anywhere! In my humble opinion people who request / demand a followback tend to be people that have an agenda with their blogs. I blog because I love it. If I didn't, I wouldn't have maintained my blog for as long as I have. I can only speak for myself, but I don't blog to get followers. I blog because I love makeup and have something to say about it. Please don't misunderstand, I love having followers, and feel so humbled by every hit my blog gets, and every comment I receive, but it is not my primary motivation. I believe many people think of blogging as a quick and easy way to get free stuff. Little do they know the time, effort and dedication that maintaining a quality blog takes. And as you said in a previous comment, many of these people stop posting after a few short months. I delete these types of comments, and any comment with a link in it is moderated on my blog. This post doll shows it all!I love following other girls,but I hate when they comment on my blog with their blog including..thanks for following me!I mean do u have to advertise it?I did it because I wanted too.On the other hand follow me and I ll follow you back is annoying but most probably I will ignore it..great post sweetheart! Laiqah - thank hun, have a rant if it makes you feel better! Hey mine here was a rant too and I just had to get it off my chest. Sara-May - I hope this helps aspiring bloggers as well, as we've all been there at the start, starting a blog and wondering if anyone will actually read it. I won't lie here, I love getting more followers too and my heart jumps every time the number goes up, but that's not what it's all about. I love blogging too, it is hard work and is time consuming, but it gives me the creative outlet that I don't get from other avenues. From now on I'm completely going to ignore followback comments and just delete them. Agree there are some pure spamming comments floating around these days. If a blogger was courteous and asked nicely I'd visit their blog to check them out, and visit them a few times to see if they write content I'm interested in. If so, they get my follow. Otherwise I just ignore. So like you say - content is king! Thanks lilpil, I feel the spammy comments were getting a bit out of control, hence my need to vent here. Great post Lilit. I occasionally get these comments and then see the same ones sprawled over a lot of other blogs. It makes me feel so awkward as I really don't want to be rude but to me it doesn't seem genuine if they are asking everyone to follow them. I want people to follow me because they genuinely enjoy reading my posts. I will take a look at any person's blog who leaves me a comment and if I really like what they have to say and find their blog interesting too then I will follow them. People that do this clearly have an agenda and make it seem like they just want to either get free things or make money. I agree that it's annoying and even embarassing to read those sorts of comments on people's blogs. It kind of tarnishes your whole experience of someones post. And is it just me, or does it scream desparado/attention seeking? Harsh judgement, but I feel that those sorts of comments imply that the person is not really in it for the love of blogging, but rather for the sense of self worth they may get out of having a host of followers. I have to say that at the end of the day I started my blog because I wanted a creative outlet, never having had one before. It's always exciting when people read and enjoy my posts, but I'm much happier in myself knowing that i've finally found myself a hobby - something I feel a part of. And in regards to having followers, you want people to follow your blog because they actually like what you do - I don't want my followers to be just another number. I have to agree with you Lilit. I'm embarrassed to say I was once one of those annoying bloggers (oh my)! I knew nothing about the blogging community, just that I wanted to be in it so badly. I wouldn't say "follow me" but I stupidly threw my link up there in my comments. It didn't take long for me to realize that it was redundant and a bit annoying lol. Glad to say I just leave my little comments now and if someone wants to check out my blog, just click my name! I'm not really sure how to handle these bloggers now. I have comments that are strictly to promote giveaways with nothing to due with my post, comments with links, comments about following...do I check them all out? Or do I risk being seen as rude and just ignore them?! Such a dilemma! This is a brilliant post Lilit! I've literally only just started a beauty blog myself, but from having an old misc. one, I get how annoying it can be! Some people don't understand that quantity does not equal quality. It really only hurts them in the long run. I'd really prefer to have only a few followers who follow for what I'm saying, as opposed to having heaps who couldn't care less! I absolutely agree with what you said, and I'm not anywhere close to getting those kinds of comments. I discovered the world of Beauty Blogging early this summer, and pretty much jumped into my own feet first and blind. It's hard, it takes work and dedication and if you don't continually work at it you'll go nowhere. That being said, I would rather stay at my few followers than gain a following only because I guilt tripped people into following me. I want readers and followers that are there because they are interested in what I have to say, not because I attacked their blog with a follow back blitzkrieg! If that means it takes time and a lot of work then I look forward to it. Challenge accepted! I now have less followers than I had when I was a spammer, but I would rather that, because I know they are following me because they liked my blog, and not because I guilt tripped them into it. ahh it's so great that you addressed this!! i dont have a blog, but it annoys me so much when people send me messages or comments to my youtube channel saying "sub me and ill sub you back" etc. i totally feel your frustration!! and i agree with previous comments...if the channel looks like something i am interested it, then i will follow it. otherwise i just ignore the comments. I think you have phrased it so well. I do hate getting comments like that and being put on the spot. Out of guilt I usually look at the blog, but most of the time don't follow. I have noticed that bloggers worth following don't leave comments like that. I like to read comments on a post I found interesting and I've picked up a lot of good tips and product suggestions from commenters. As a reader, I find comments promoting sites or giveaways annoying too. It's a waste of everyone's time to wade through them. Thanks, Lilit, for posting the things that we all want to say. I completely agree with you about the spammers. xD I was aware people did this, i've always tried not to because it seemed like it would be counter-productive. I have to admit, I was amused when reading the bit about how they address their mail to the wrong blogger! Haha! I want to take as many precautions to avoid falling into that kind of mold. I agree wholeheartedly with your four tips - especially the time and perseverance! Thank you everyone for your comments and support in this. Glad to see I'm not the only one getting annoyed, and I do hope spam comments stop as there are some great bloggers who are unwittingly becoming spammers and doing themselves a disservice. I can relate! I get these all the time, and it does get annoying. This post is brilliant, and I hope this will teach people that it's not the way to go about getting followers. I just delete them! Thank you for your tips to increase readership! i couldn't have said this better myself. I hate when I get nice comments and then followed by it i get i followed you now follow me back? Ugh . . . it's so irritating anyways I just found your blog linked my chica bloggerist and I'm really enjoying it! THanks for this lovely post. Couldn't have said it better myself! I've only ever followed one blogger that emailed me to follow, and I actually enjoyed the blog content. They don't really post terribly original stuff, but I like their blog for makeup inspo pictures. Thanks for posting this Lilit, I think if people have a good quality blog and post great content then the followers will come. Hassling people to follow you is the worst possible way to get started in fact when I started my blog I did so little promotion because I wanted my writing, photos and content to get to a good level before many people saw it. To be honest I still don't do any promotion just interacting on twitter and commenting on other blogs, satisfies the social butterfly side of my personality! I want people to read my blog because they want to and I'm able to provide them with info or enjoyment not just for the sake of having followers. I get the odd email asking to link their website on my blog and they'll link mine in return however they never even tell me what the link to their website is so I just ignore it. If someone leaves me a comment asking me to follow them, I will never click on their link. I find it incredibley offensive in fact. I also don't do giveaways or really participate in them either, because I find it is the same kind of thing; a followers grab. I think it defeits the whole purpose of what blogging should be about in the first place! Great post, thanks for saying it! I'm commenting a bit late because I'm so behind on my google reader...sorry! This really struck a cord with me. I'm pretty new to blogging so I've gotten a really big shock lately with spam on Twitter. For example people following me, (and usually ten of my friends) waiting for me follow them back then unfollow. Or people saying they like my blog, however when I go to their profile they've copied and pasted the same words to 50 others in the same hour. I think they're missing the best part of blogging and no, I don't want to read a blog by someone who sees me as a hit on their stats first and a person second! Oh my I guess I needed to get that off my chest. :| Eeep! Anyway yes to this post! Annoying, they are. That's it! Check out my giveaway, follow my facebook, twitter and buy salt from tears of unicorns from my Etsy shop. I know you want one! Great post, found you via search engine as I was getting annoyed by the spamming comments and wanted to know what others thought I have deleted any new comments that say 'great blog want to follow each other' I mean if you like my blog so much why not just follow?!! !